While many other universities move their collections off site, the University of Chicago is making a landmark investment in keeping books at the heart of campus. The Helmut Jahn–designed Mansueto Library features a 50-foot-deep underground storage facility with an automated storage retrieval system capable of housing 3.5 million volumes, topped by an elliptical glass-domed structure. The ground floor of the building will house collection service areas, a reading room, and Library preservation/conservation facilities. It will be connected to the Joseph Regenstein Library via an enclosed walkway. During the year, the basement structure was completed and work began on the erection of the dome’s steel frame. The new library is scheduled to open in spring 2011. The May 12 groundbreaking for the Logan Arts Center was heralded with a campus-wide multimedia celebration of the arts. The Logan Arts Center will be a place where intellectual inquiry meets creative practice, across a wide variety of the arts. It will be home to a black box theater, a proscenium theater, a 450-seat performance hall, a film screening room, visual arts galleries, studios, practice rooms, classrooms, and more. 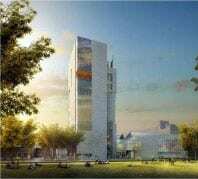 With its 184-foot-tall tower, the building at 60th Street and Drexel Avenue, designed by Tod Williams Billie Tsien Architects, will be the tallest University facility south of the Midway. Sustainable design features—including solar panels on the south-facing sawtooth roof over the artists’ studios and shops—are expected to earn the building a minimum of LEED Silver Certification. The project is scheduled for completion in spring 2012. The New Hospital Pavilion will provide the optimal setting for patient care, innovative clinical research, and medical education upon completion. It will serve as the new “core” of the Medical Center campus and a home for many of its most distinguished clinical programs—those that provide complex specialty care focusing on cancer, gastrointestinal disease, neurological disorders, advanced surgery, and high-technology medical imaging. The flexible design will foster collaboration and interaction among clinicians and enable adaptation to the rapidly evolving nature of modern medical technology. The 10-story, 1.2-million-square-foot Rafael Viñoly–designed structure is the largest building project ever undertaken by the University, spanning two city blocks, with each floor plate sized at about 100,000 square feet. The hospital is scheduled to be completed in January 2013. Construction began on the Center in Beijing, an innovative new expression of the University’s global engagement, in one of the world’s major capitals. Growing out of a long history of intellectual collaboration between scholars from Chicago and China, the center is designed to bring together students and faculty at all levels, representing all the University’s schools and divisions. It will host international conferences, act as a home for research efforts, and house such programs as the College’s Civilization Abroad. To help maximize the exchange of ideas, the 23,000-square-foot center is located in the Haidian District of Beijing, known for its rich intellectual ecology of top Chinese universities, research institutions, and government policy centers. The facility includes offices for faculty and graduate students in residence, seminar rooms and lecture halls, a café, and flexible spaces for exhibits, private meetings, and public gatherings. The design evokes elements of University instruction and research space as well as contemporary Chinese sensibilities. Construction was completed over the summer of 2010, and the Center in Beijing began operation in September. The University is moving away from stand-alone heating and cooling systems to new technologies and efficient new facilities that use a minimum of energy to deliver steam and chilled water to a growing campus. Last year, the South Campus Chiller Plant and the first phase of the South Campus Utility Corridor were completed. During fiscal year 2010, the West Campus Combined Utility Plant building was completed, while work on the chillers and two steam boilers continued. 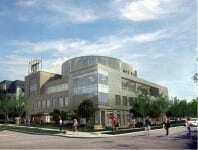 Construction also began on the second phase of the South Campus Utility Corridor. This phase extends steam and chilled water distribution, as well as IT cabling to supply the Edelstone Center, Social Service Administration, and Logan Arts Center. 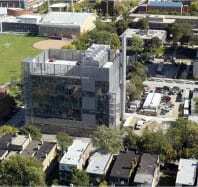 Construction on the new home for the Chicago Theological Seminary at 60th Street and Dorchester Avenue began in June. A joint project between the University and the independent United Church of Christ seminary, the new building replaces the seminary’s existing building at 5757 South University Avenue, which was purchased by the University. The project consists of the construction of a 78,000-square-foot, four-story building to house faculty and staff offices, classrooms, a library, and worship and meeting spaces. With a green roof and other sustainable design features, the building is seeking a minimum of LEED Silver Certification.